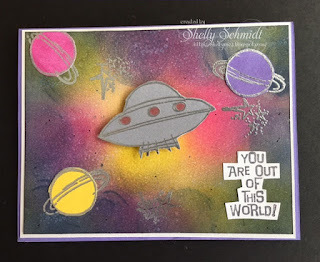 As long as I had the Distress Inks out, I inked up another piece of cardstock using many ink colors and stencils. 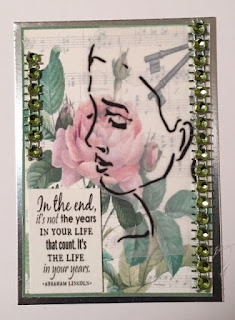 I have Elizabeth Crafts Designs stickers that are used with Glitter Ritz and colored (over the Glitter Ritz) with Copics. 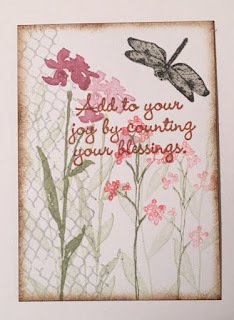 I joined in an ATC swap using any floral image plus a positive sentiment. 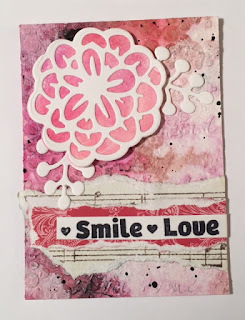 I stamped and embossed this sentiment from Sweet and Sassy Stamps on vellum and laid it over the floral layer. 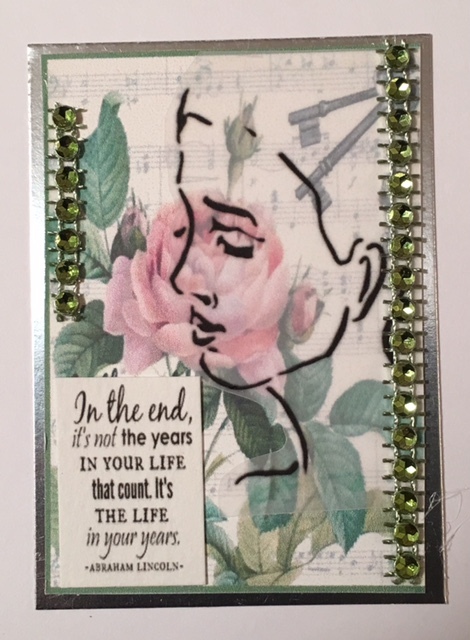 I received some wonderful ATC's back- I have to say- I love all of them! 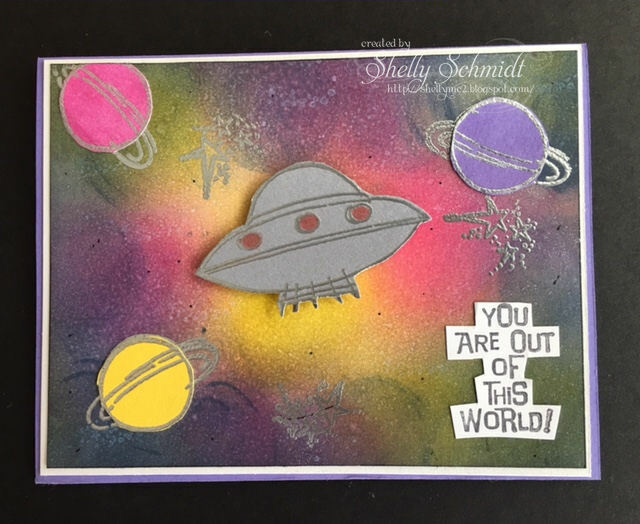 This ATC is by Buffy Burnside. 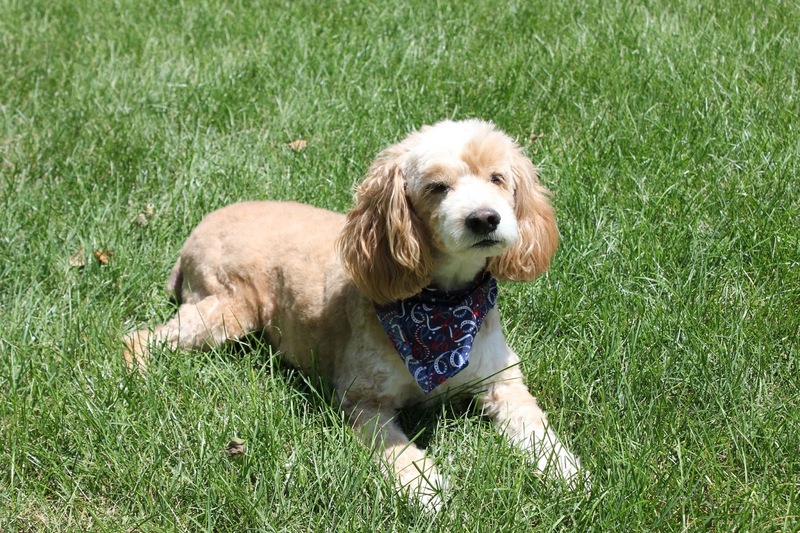 And, finally, this is by Tara Duvall. I wanted to pop in and post a card for National Love your Pup Day. Haiku Poems consist of three lines. The first and last lines have 5 syllables and the middle line has 7 syllables. Rarely do they rhyme. 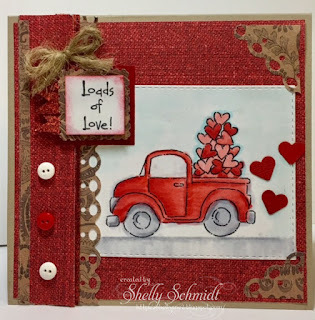 This card was so fun to make- a little time consuming- but I love the way it turned out! I used dies from Frantic Stamper of the little Paper Doll Geisha's and Washi paper. The backing behind that is paper I bought in China a few years ago. I used some Graphic 45 Bird Song paper for the background layer. When I worked on my Haiku, I decided to add a little Basic Grey Bird. To see my little cheat about using the dies with many little parts, scroll to the end of this post. 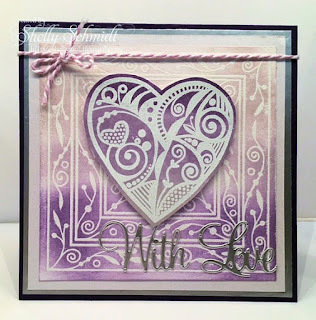 This was made by Laurel S in the About Oriental Art Yahoo Group- I think it is stunning! 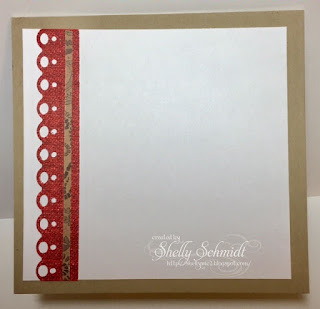 You would add more tape if the dies were larger (just add it side by side on the cardstock). 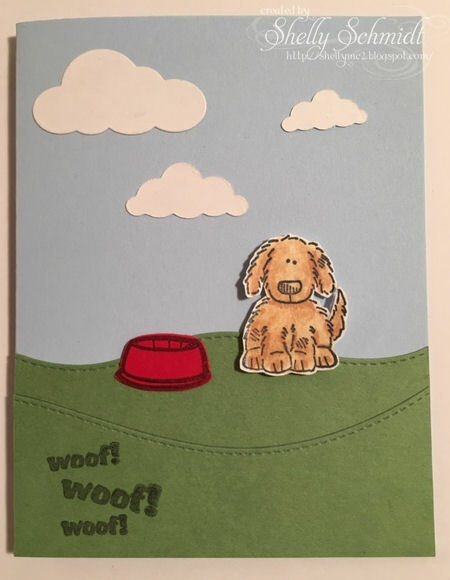 You will just peel off the white tape and viola- your die cut has a sticky back. Paper: Red denim and black & tan paisley- recollections, solids by Bazzill- Cinnamon Stick and Ruby Slipper. Burlap twine by "Brother and Sister", Red shimmery flat ribbon by "Celebrate It"
Image and sentiment retired SU Loads of Love. 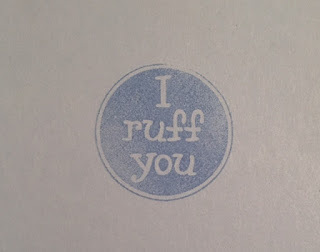 Image was stamped with Black Tuxedo Memento ink. 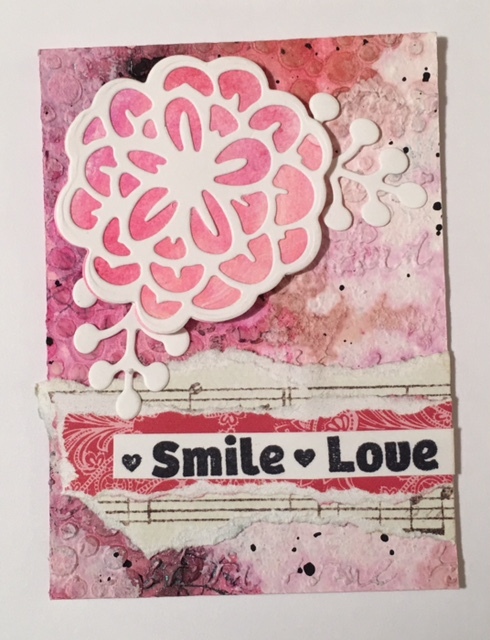 The Dueling Darlings are a group on Splitcoaststampers. We are divided up into the Divas and the ***Dazzlers***. Each group receives a kit, and we all create with a like theme. Then, we hop to each others blogs to see what everyone has created. 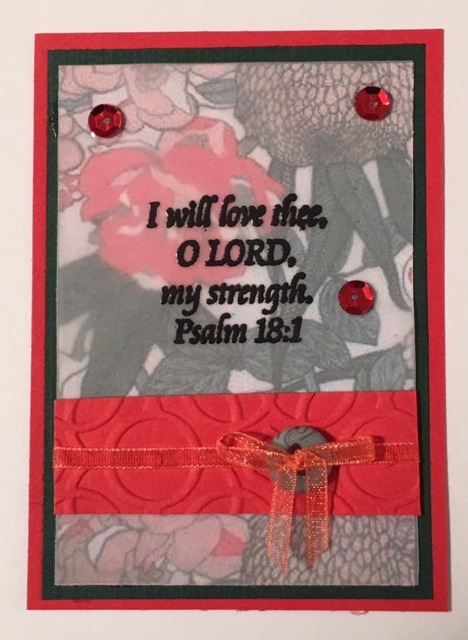 For the Crafters of Faith (COF) February challenge, we are pondering on 1 Corinthians 16:14 Do everything in love. Our instructions from hostess Barb state: This does not need to be a Valentine card, so you can make a card or a tag or anything else for any occasion, with Love! I got bitten by a technique challenge bug : ) I have not really tried an ombre card- that I can recall anyway..... so I combined the two challenges. 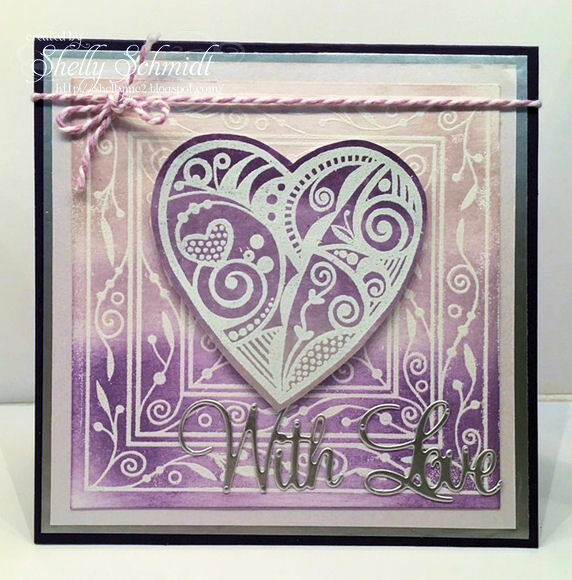 I used Distress inks after embossing the background image with white embossing powder graduating lighter to darker inks. 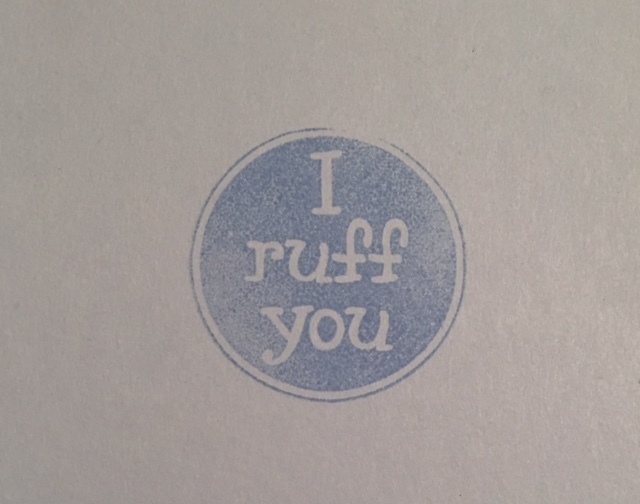 The heart uses the same inks and I turned it upside down so the darker ink on the heart is at the top. On the inside, I punched out hearts in the three shades of purple. I made this for my husband- who is so much love!!! We did not feel love at first sight,,,at all.,,, Maybe that was God's plan, once we finally really got to know one another and gave the other a chance, it was - Love is in the Air : ) We have grown in love and faith as we have walked this journey- 30 years-celebrating in a couple of weeks. 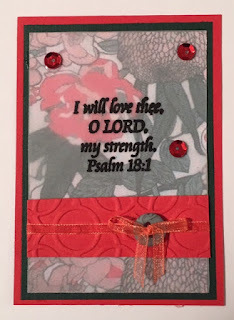 Crafters of Faith is a group over at Splitcoast Stampers. A faith walk by Kelly, our leader in the group. 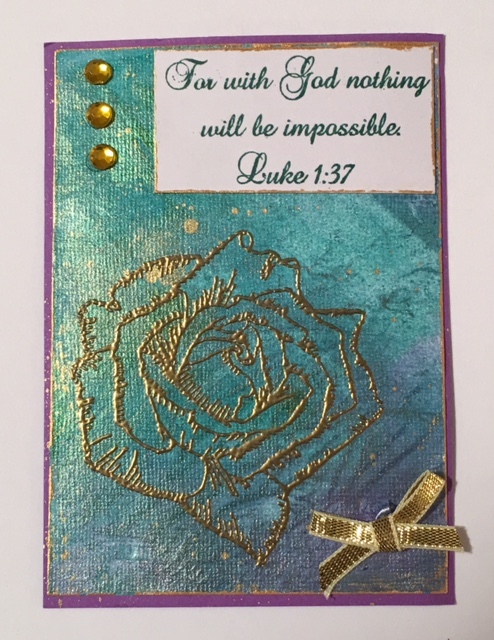 Each month we ponder on a scripture by a volunteer of the group and create with that as our motivation. 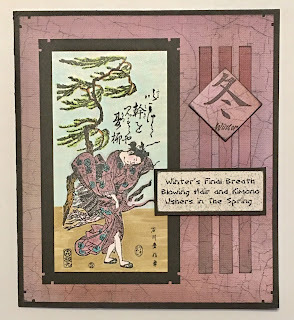 I made a card using Japanese colors for this time of the year for a mingle at the Yahoo Group "About Oriental Stamp Art". 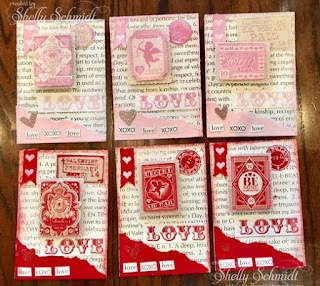 I was able to use a couple more unused stamps- my goal again for this year. The geisha is from I Brake for Stamps. 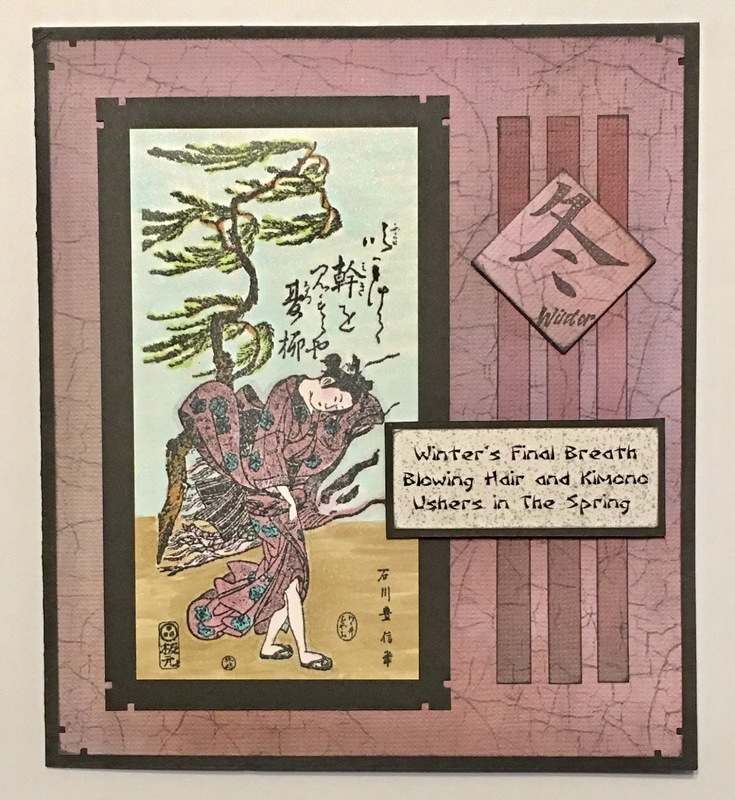 The Plum Blossom image is from a stamp sale and was not marked. The Plum Blossom Kanji is Art Neko. The images were all colored with Copics. How fun to use your stash as well- the Glittery Washi I just had to have, and it works perfectly for the color theme.